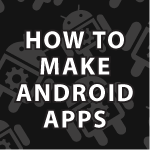 In this tutorial I will cover pretty much everything there is to know about how to make Android apps. Videos will focus on explaining the major topics in easy to understand ways. I’ll also make a bunch of apps. Every article can be found below with a description. The videos are structured so that the videos will work on their own, but also as courseware that provides a complete understanding of Android. Android Studio Tutorial : We’ll look at how to install it on Windows and Mac OSX. Then well configure everything properly to make sure we handle the potential errors. We set up gitHub and go over how to push to remote repositories. We then look at Gradle, the interface and much more. How to Make Android Apps : This begins my new Android tutorial series. I cover all the basics so you are ready to go. How to Make Android Apps 3 : I’ll cover Android ListViews, ArrayAdapters, Custom Array Adapters, ListAdapter, LayoutInflator, ImageView, and a great deal about terminology that confuses people. How to Make Android Apps 6 : I show how to set up Android Studio 0.8, show the files you need to install in the SDK Manager, and how to set up a working Android Virtual Device. I’ll also show how to fix the UIDs are inconsistent error. How to Make Android Apps 11 : In this video I present the Android multipane Fragment example code many of you have requested. I did my best to create a template you can use in numerous apps. I also did my best to keep the code very short. Web Services Video Tutorial : In my web services tutorial I will cover generating JSON and XML. We’ll then walk through examples in which we use REST, SOAP and RPC (Remote Procedure Calls). To finish off everything, I’ll then create a translation web service that can translate into 10 different languages. How to Make Android Apps 16 : In this video I complete the Android Translation app! I provide both an Android Text to Speech Example as well as a Speech to Text example. I also review how to use Spinners. How to Make Android Apps 17 : In this part of my Android tutorial I cover 3 ways to save data. We’ll look at Bundles, onSaveInstanceState, SharedPreferences, and PreferenceActivity. We’ll also be reviewing working with components, Intents, click listeners, onActivityResult and a bunch of other topics. How to Make Android Apps 18 : In this part of my Android tutorial we cover how to use Intent Services, Broadcasts, Broadcast Receivers, Intent Filters and how to download, save and read files. How to Make Android Apps 19 : In this part of my Android video tutorial I’ll cover the NotificationManager, TaskStackBuilder, PendingIntent, AlarmManager and more on Intents. The focus this time is on being able to notify the user of events even if my app isn’t running. How to Make Android Apps 20 : In this part of my Android tutorial we will cover using SQLite. We’ll create the database, verify its creation, add data, delete data, display data and delete the database. We’ll also explore Cursors and more. How to Make Android Apps 21 : Welcome to my Android Content Provider tutorial. I’ve received many questions about this topic. I have received many questions specifically about how to access a Content Provider from another application. So here I’ll make to apps. One will function as the Content Provider and the other will access data using a Content Resolver. How to Make Android Apps 22 : In this one video I’ll provide an Android Text Messaging example program. I’ll cover how to send and receive text messages. I’ll also talk about Android Handlers and threads. How to Make Android Apps 23 : In this tutorial we’ll make an Android Google Map example program. Along with that I’ll also show how to create a splash screen and how to sign your APKs so you can distribute your app.